The Madison Night Stand features flat panels, frames with handsome cut edges, and tapered legs. Handcrafted by expert Amish craftsmen from kiln-dried, solid wood. 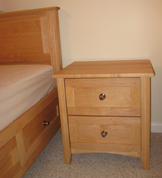 No plywood or particle board is used in our furniture. Only a nontoxic, water-based glue is used as necessary. 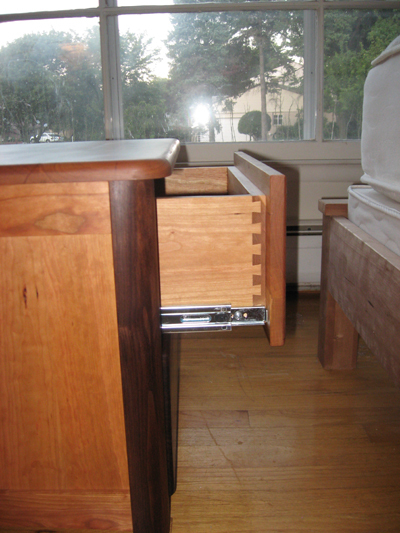 Drawers are dovetailed. Drawer bottoms and back of night stand are shiplapped. Drawers come with wood knobs and ball bearing slides for the prices below unless wood-on-wood is requested. Soft-close mechanisms may be ordered for an additional cost. 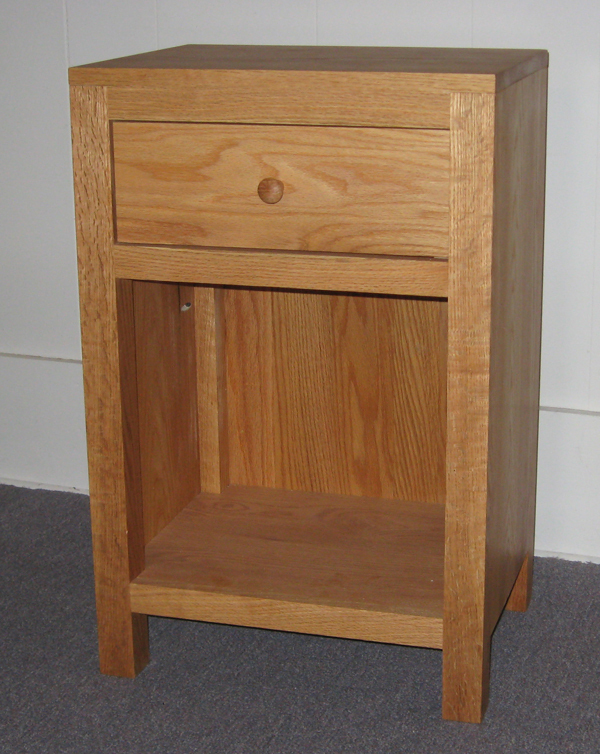 Size of night stand pictured: 18.5"DX23"WX26 3/4"H. Also available in custom sizes upon request. Pictured with 1 drawer with storage space below for such things as books. Other configurations available upon request, such as 2 drawers or 3 drawers. 3-drawer configuration would require taller height. Additional charges as applicable. Wood Choices: oak, maple, cherry and walnut. Finished with all natural, nontoxic tung/linseed oil and beeswax products. Matching bed frame, dresser, tall chest and toy chest available. The Greenfield Night Stand features simple Shaker flat panels, square-edged frames and tapered legs. Handcrafted by expert Amish craftsmen from kiln-dried, solid wood. 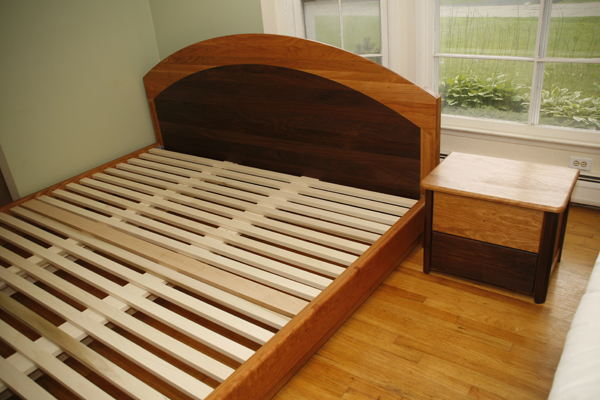 No plywood or particle board is used in our furniture. Only a nontoxic, water-based glue is used as necessary. 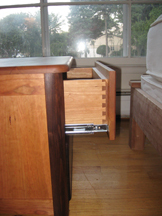 Drawers are dovetailed. 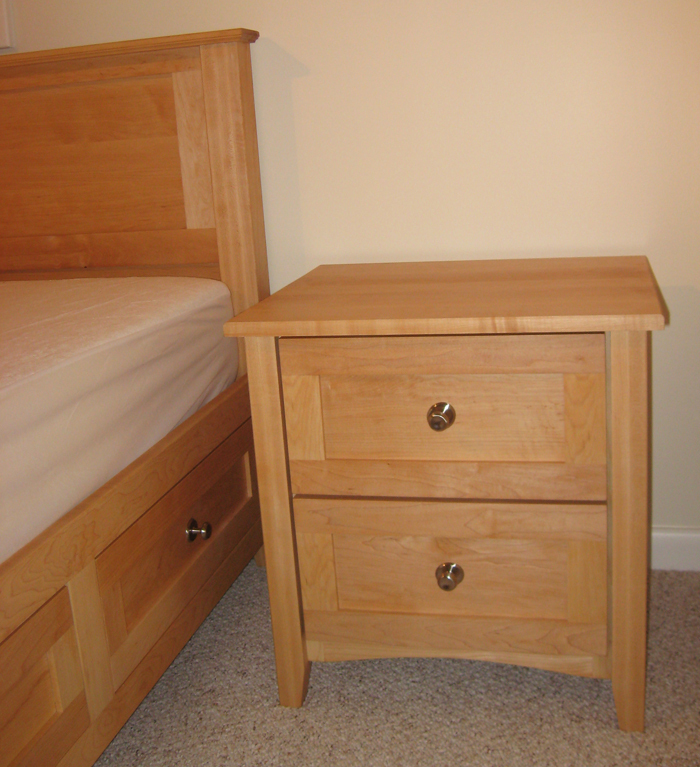 Drawer bottoms and back of night stand are shiplapped. Drawers come with wood knobs for the prices listed below. Ball bearing slides standard. Soft close mechanism available upon request for an additional charge. 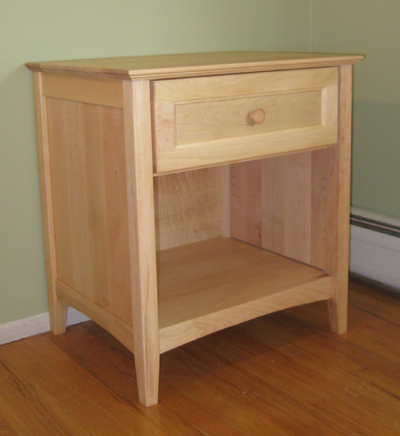 Size of night stand pictured: 18.5"DX22"WX23"H. Also available in custom sizes upon request. Pictured with 2 drawers. Other configurations available upon request, such as 3 drawers or 1 drawer with storage space beneath for such things as books. 3-drawer configuration would require taller height.Additional charges as applicable. Wood Choices: oak, maple, cherry and walnut. Finished with all natural, nontoxic tung/linseed oil and beeswax products. 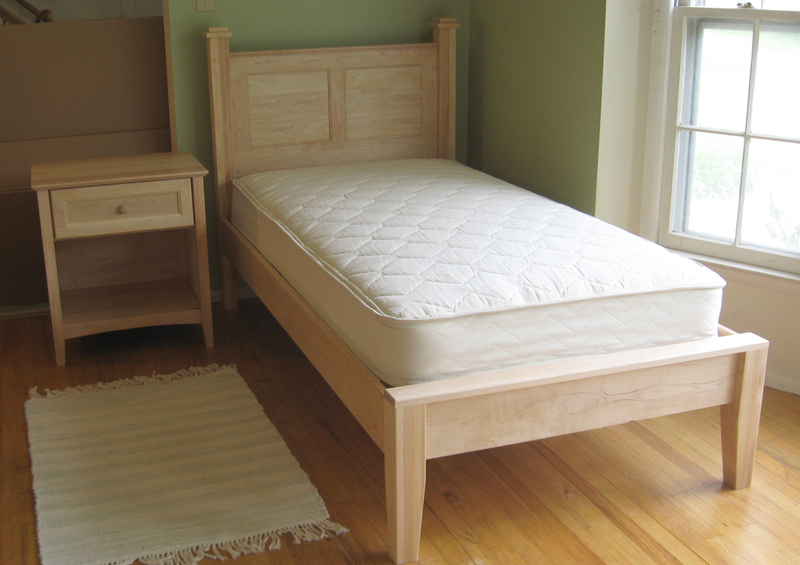 Matching bed frames (regular and storage), dresser, and tall chest available. The Lotus Asian-style Night Stand, designed to go with our rounded Asian-style and Rainbow bed frames, features rounded corners and tapered legs. Handcrafted by expert Amish craftsmen from kiln-dried, solid wood. 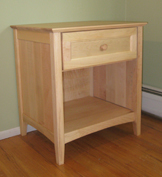 No plywood or particle board is used in our furniture. Only a nontoxic, water-based glue is used as necessary. Drawers are dovetailed. 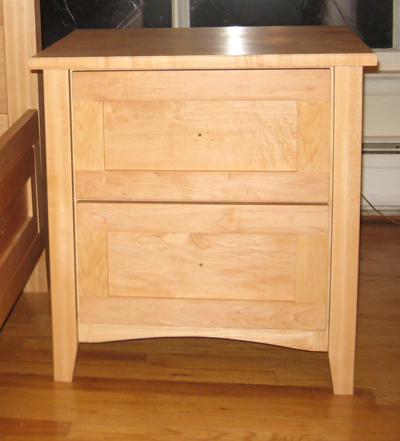 Drawer bottoms and back of night stand are shiplapped. Drawers come with wood knobs and ball bearing slides for the prices below. Soft-close mechanisms may be ordered for an additional cost. 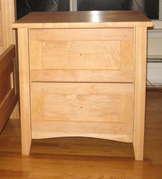 Size of night stand pictured: 17"DX24"WX19"H. Also available in custom sizes upon request. 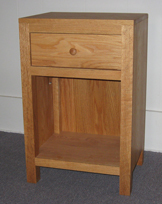 Legs may be ordered taller than shown on night stand pictured. Pictured with 2 drawers. Other configurations available upon request, such as 3 drawers, or 1 drawer with storage space beneath for such things as books. 3-drawer configuration would require a taller height. Additional charges as applicable. Wood Choices: oak, maple, cherry and walnut. Finished with all natural, nontoxic tung/linseed oil and beeswax product. Matching bed frames, dresser and tall chest available. 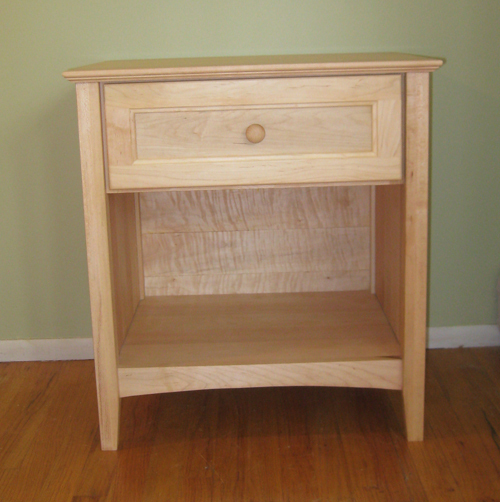 The Simplicity Amish Night Stand features straight, simple lines and wood-on-wood drawers. Handcrafted by expert Amish craftsmen from kiln-dried, solid wood. 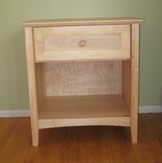 No plywood or particle board is used in our furniture. Only a nontoxic, water-based glue is used as necessary. 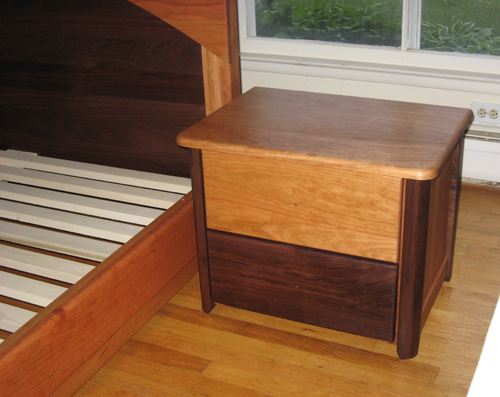 Drawer is dovetailed. 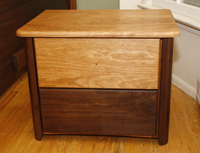 Drawer bottom and back of night stand are shiplapped. Drawer comes with wood knobs. 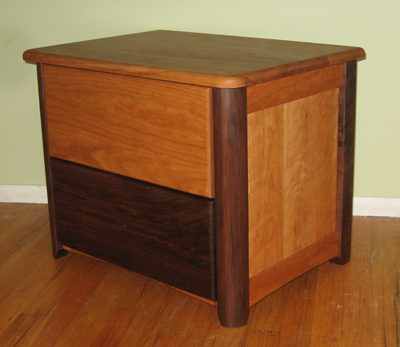 Size of night stand as pictured: 15"DX19"WX28"H. Also available in custom sizes upon request. Pictured with 1 drawer with storage space below for such things as books. Other configurations available upon request, such as 2 drawers or 3 drawers. Additional charges as applicable. Wood Choices: oak, maple, cherry and walnut. Finished with all natural, nontoxic tung/linseed oil and beeswax products. Matching bed frame, dresser, and tall chest available.